I was in Target. They were there. I couldn't help myself. I'll say this, before i dive into what I got: 2017 Topps is, as a base set, ambitious, and accomplishes a lot of the things they couldn't in 2016. The inserts are still flawed, and the lack of career stats is concerning, but this is, completely chalked up, a step forward. It's not perfect, but it's better than last year's, and that's all it needed to be. 335- Jeff Hoffman. Starting off with the main, non-Reyes acquisition in the Troy Tulowitzki trade. 98- Junior Guerra, one of the few bright spots of last year's Brewers' season. 25- Giancarlo Stanton. i dunno, the last few seasons are beginning to worry me. If he doesn't turn things around, he might be headed toward Mo Vaughn territory. 96- Jose Quintana. I mean, at least the Sox managed to hold onto him. 142- CARLOS RUIZ AS A DODGER. YES! IT DOES EXIST! I mean, he'll be playing for Seattle this season, but still. 56- Danny Salazar. proof that the Indians' rotation is just too good now. 256- Tony Watson. For lack of a better option, the Pirates' 2017 closer. 117- AAAAADRIIIANNNN GONZALEZ. One of my favorites to collect. 293- Aledmys Diaz. So good, he almost made me like a Cardinal. 38- Stephen Strasburg. Taking over for Adam Wainwright as the Unluckiest Great Pitcher in Baseball. 324- Ben Revere. Will hopefully have a better season in Anaheim. 62- A FANTASTIC Daniel Murphy card. Will be even better if he keeps up this awesome momentum from 2016. 99- Michael Wacha. For lack of a better option, the Cardinals' 2017 5th Starter. 60- Jose Bautista, somehow returning to Toronto for a year. 170- Leader card of...sigh...CURRENT YANKEE, Chris Carter. SALUTE- Robin Yount. Weakish design, but at least it's a Yount. 5 TOOL- Miguel Cabrera. Now THIS design I really like. First Pitch- JOE MANTEGNA for the Cubs. One of the ones I was looking for, on account of House of Games, Fat Tony and...being a friend of a friend, let's just say. Awards- Mitch Moreland. These are still boring. 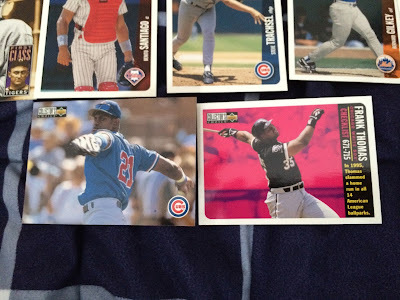 A REDISCOVER TOPPS BUYBACK OF.... 1997 Dave Martinez. WOO. 45- Joakim Soria. At least it's nice to see him back in a Royals uniform. 44- Paul Goldschmidt, one of the most underrated yet still overrated players in baseball. 53- Ryon Healy RC...so at least I have that to keep around. 317- Mitch Moreland, now with Boston. 168- Ryan Zimmerman. He's definitely slowing down, but he's still a big part of the Nats' offense. 164- Matt Harvey. Now...hopefully he has another amazing season this year. I hope so. NO INJURIES please. 105- Francisco Rodriguez, who's been through more incarnations and reincarnations than Doctor Who at this point. 87 Topps insert of...Stephen Strasburg! In 2010, I'd be flipping out. Now...I still kinda am. So...2017 Topps is still a pretty enjoyable product to open. I'll try to get more Series 1 before the other sets close in on the market. And so we soldier on with the 1996 Collector's Choice break. With the added element of 'YOU CRASH THE GAME' inserts, as well as the insane amount of great base card, there's enough to tide us over for another two posts. After that...we're going to explore a very, very dark set. Don't say I didn't warn you. Surhoff had some okay years with Baltimore, mostly backing up Chris Hoiles until he somehow got a starting gig. Ruben Sierra was good for DHing gigs and a killer 1992 Stadium Club card. The dearly departed...in the same pack. Damn, '96 CC. Frank Thomas' is a YOU CRASH THE GAME! So...WOULD YOU HAVE CRASHED THE GAME? Let's see, did the Big Hurt hit one out in between Sept. 2nd and 4th? YES. He had a nice one on the 4th. So...if this were 1996, SEND IT IN! 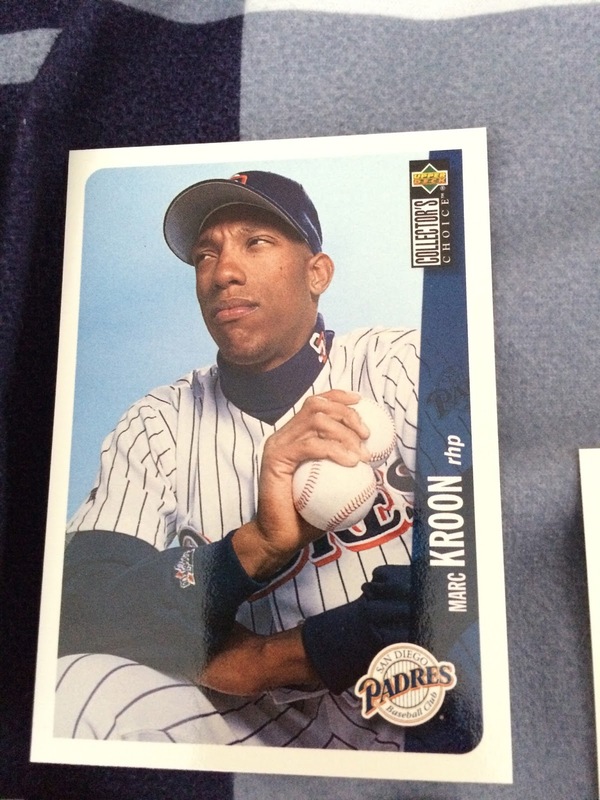 Also, Jermaine Dye's rookie card was in this set. Huh. Tim Salmon was the checklist poster boy for the Angels this year. I guess it makes sense. Pensive fielding shots- Darrin Fletcher's is dramatic, while Keith Lockhart's has a bit more 'OHHHH NOOOOOO!' balanced in. Tim Salmon is our latest You Crash the Game. WOULD YOU HAVE CRASHED THE GAME? Did Salmon hit one out from Sept. 9th-12th? No, he did not. Down series for Salmon evidently. As an added bonus, an autograph-hunting Frank Thomas is the checklist for the South side. Tony Pena's splitting, in preparation for...uh, being the Indians' backup for 1996. Chris Gomez' swing shot is a pretty damn cool one. PEDRO MARTINEZ...true to character, he gets a pretty powerful base card. Jason Kendall's RC one is a bit too dull and static for me. Another checklist shows a nice, full bleed autograph shot of the great, powerful, and LEGENDARY Cal Ripken. Sid Fernandez somehow on the Phillies? The Loretta is evidence that maybeeee the Brewers' mid-90's uniforms needed a few more tweaks. Ernie Young just seems jazzed to be here. Shawn Estes' is a pretty nice action shot. The Cal is one of the set-encompassing CAL RIPKEN COLLECTION, giving a ton of great photos a season after his record-breaking tear. Also, Richard Hidalgo looks like he's here for a golf demonstration. Because it was 1996, Gary Sheffield was the Marlins' checklist. Here, it looks like he's about to give a Tarantino-esque final blow to someone's face. Our only highlights here were a Cecil Fielder checklist and a nicely-done Edgar Renteria rookie. Ellis Burks was still an offensive threat, even away from Boston. Also, Marvin Benard looks really, really happy for some reason. Delino DeShields makes a great catch, while Rick Aguilera seems to be yanking off several people's arms at once. 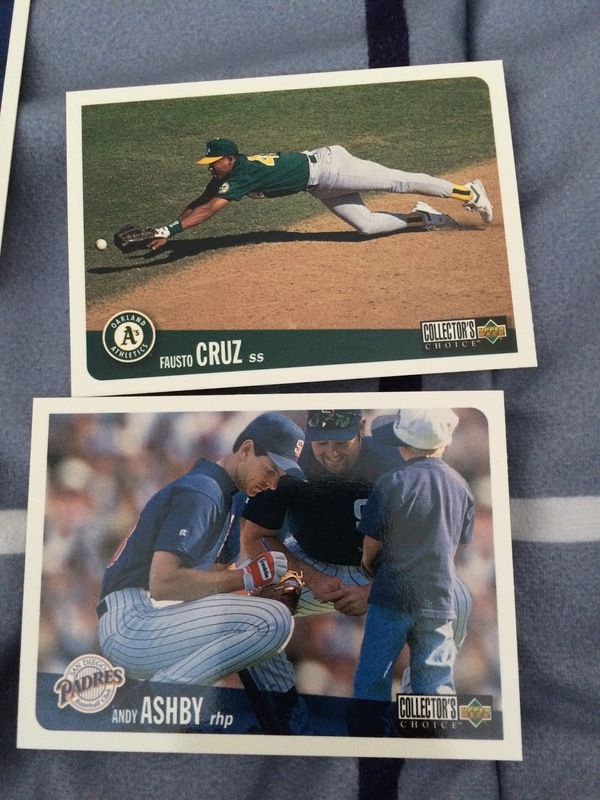 What seems like the thousandth full-bleed checklist in this set, of Juan Gonzalez. Steve Finley furiously runs, while a slightly-less furious Antonio Osuna laughs from the sidelines. Hey, remember when Brooks Kieschnick was supposed to be this huge rookie phenom for the Cubs?? Rich Becker makes a long-lunge to warrant a pretty cool horizontal shot. The most undeserving one-and-done Hall of Fame balloters- Hideo Nomo, in yet another Scrapbook insert, and a close-to-rookie card of the great Jorge Posada. The 90's Brewers were so bad that all they could get for a checklist was a smiling, posed Greg Vaughn. A smiling Jim Eisenreich, and an aggravated , pointing Mike Bordick. Probably one of the only Arizona League subset cards that's actually worth anything, here's a rookie-ish card of Johnny Damon, which is always a nice get. A seriously throwing Paul Assenmacher, and a relatively graceful late-career card for Brett Butler. Plus, here's a fun card of Ismael Valdes waiting for the outcome of the throw. On one-hand...three-billionth checklist. But still, there's a Billy Wagner Rookie Class card we get to have, so it's not all bad. The last fourth will be up very soon. I posted 9 packs yesterday, and I'm posting 9 packs today. It's that simple. Until we actually get spring training photos, these box breaks are really all I can do with the blog. Still, this is a hella fun set to break, so at least there's some entertainment value in it. Right back into the swing of things with this photography. I forget how much I liked the shade of green the A's used in the mid-90's. By 1996 Danny Tartabull was treading about the league in search of a team willing to put up with him. He didn't last long in Chicago. Meanwhile, Harold Baines is a legend there. He played fair. Curt Schilling's HOF chances are dwindling with every boneheaded comment he makes. Mike Piazza, on the other hand, is a respected Hall of Famer now. He's also the Dodgers team-checklist. Travis Fryman SINGS! Classic in 90's cardboard. GET. A LOAD. OF THIS ONE. Rex Hudler milks a cow. Oh my lord. I mean, everybody knows the 'Rex Hudler angrily defends a pole' card, or 'Rex Hudler is befuddled in Studio'...but how do more people not talk about this one??? HOW? Luis Sojo is rather happy here. Armando Reynoso's card is a pretty great action shot. The TC for the Twins was Marty Cordova...okay, even if he was the 95 ROY, that's still a lot of weight to put on a guy with a year's experience. A rather bored-looking John Mabry during the national anthem. We've seen Piazza, but Kenny Lofton was the Indians' TC, and after his pretty great '95 season I'm all for it. THAT...is a pretty fantastic Tom Pagnozzi card. Just in mid-reach. Fantastic. Shannon Stewart's rookie card here was so awkward that I got two of them. Mike Stanley was catching for the Red Sox in 1996. Huh. Andrew Lorraine doesn't seem too confident in him. A pretty nice action shot for a fairly unspectacular Braves pitcher. GREG MADDUX IS A CHECKLIST. ...Roger Clemens is also a checklist. Fausto Cruz DIVES! He misses it because Miguel Tejada is still in the minors. Andy Ashby takes a knee while there is clearly a young person somewhere about. This is a very great shot. ...Very weird shot of a guy I have never, ever heard of. Benito Santiago played for a ton of teams over the course of his career. He played for the Phillies for one season, to take over for Darren Daulton in between he and Mike Lieberthal. 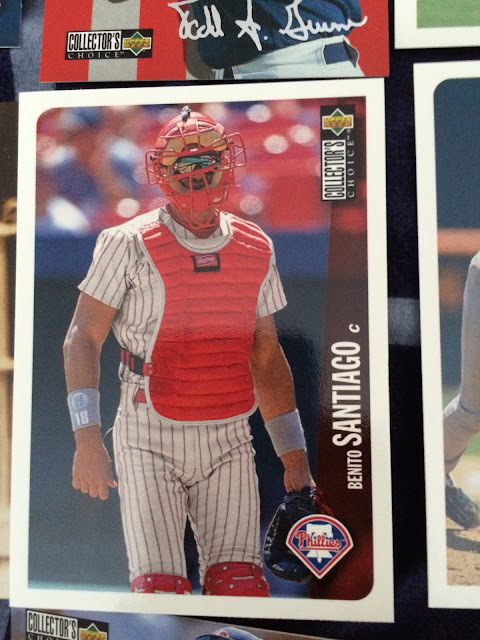 And oh...even if he didn't do the greatest job...it's Benito Santiago as a Phillie. It's still amazing. Sammy Sosa is the Cubs' checklist. Frank Thomas is the set checklist. Two very cool shots of not-so-cool players. Collector's Choice could do this to even so-so players. They didn't care. Another WAY-COOL Hideo Nomo insert, as well as a Mariners TC of the poster boy. Three relatively cool fielding shots. Joey Hamilton's has some nice depth, in the banner in the backstop. Cordova's is another checklist. Really putting all those eggs into the Cordova basket, eh UD? Wilton Guerrero's rookie is in this set. Huh. WADE BOGGS rightfully got the CL gig for the Yankees. Well done, UD. AH, NOW TO PLAY EVERYBODY'S FAVORITE GAME! WOULD YOU HAVE CRASHED THE GAME? The way it works? This pack contains a You Crash the Game card of Manny Ramirez. The sweepstakes worked so that if Man-Ram hit a homer in between the time radius, you'd be entered in to win something cool. Luis Vizcaino runs, while Rich Aurilia looks awesome for the camera. More really, really cool horizontals. The Greer we've seen before. 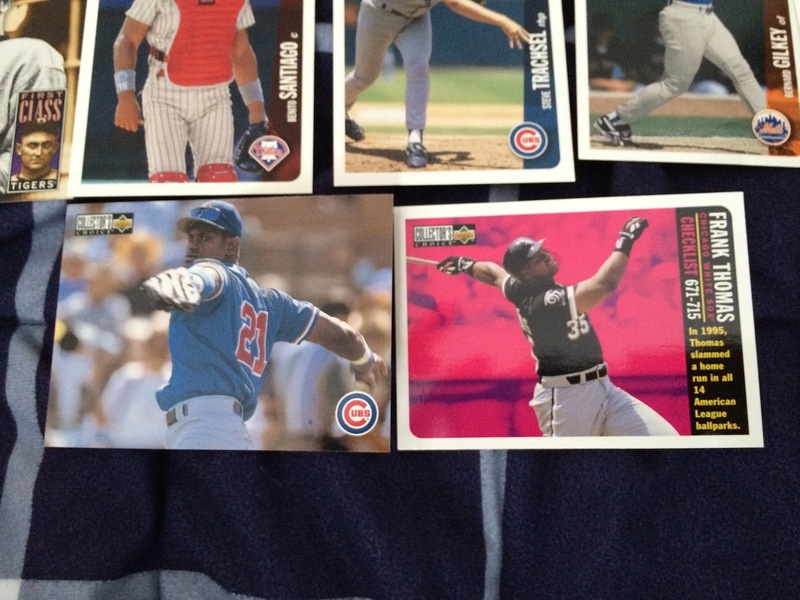 Livan Hernandez and Chan Ho Park have rookies in this set. Good to note. The Royals were so dire in 1995 that they gave the checklist to rookie and future standout Johnny Damon. Good for him. Kevin Jarvis escapes from the smoke, while Mike Deveraux seems relieved to still be in Baltimore. That is a VERY COOL, and very unusual card of Mark Whiten on the Phillies. Wish there were more. Meanwhile, Mike Macfarlane signs autographs, and doesn't seem too happy about it. Moises Alou was the checklist for the Expos...which means the Upper Deck fell into that unfortunate habit of forgetting Hall of Famer Pedro Martinez exists. Tony Gwynn gets a set-checklist, while Matt Williams gets what must be one of the first full-bleed base cards in several packs. Welp, Dante Bichette's is a You Crash the Game card, which means we get to play WOULD YOU HAVE CRASHED THE GAME? So, did Dante Bichette hit a home run between Sept. 9th-12th of 1996? No, he did not. Welp. Thankfully, we did manage to pull the last of the five FIRST CLASS inserts I needed, which was the Great Bambino himself, BABE RUTH. And a pretty nice Babe Ruth at that. So...that's part two. Maybe it's all the You Crash the Game inserts, but this box is getting good. Part 3 will be up soon.